Last week, we reviewed 70-80 years of history about workplace seating arrangements. We ended up with a quick look at the cubicle—now one of the most disparaged pieces of office furniture ever. However, when it was first introduced the cubicle enjoyed a positive reception. There’s a perception today that cubicles replaced private offices and companies need to go back to having private offices for everyone. The fact is that cubes were the closest thing a traditional low-level “bullpen” employee would ever get to an office. According to designer Douglas Ball (one of the men who was involved in early cubicle design), this type of workstation was originally intended to be a step up the corporate ladder, not a step down. Unfortunately, what started out as a generously sized, enclosed workspace soon began to shrink. From 1994 to 2010, workers lost 15 square feet of personal space in the average cubicle. The backlash against cubes getting smaller and smaller led to the introduction of the “open office” layout. In an attempt to counterbalance the claustrophobic cube farm trend, dividing panels were shortened and made of partly or completely transparent materials. Next, benching systems came into vogue. Employees began sitting directly across from each other with no visual or noise privacy at all. This workplace seating arrangement turned out little better than the original bullpen setup of the first half of the twentieth century. Fortunately, the pendulum appears to be swinging to the center now. Today, more and more office seating arrangements are ‘multiple choice’. Workers may have the option to sit at an assigned desk or take their laptop to a collaborative area or a secluded spot. Coworkers may even band together and rearrange a highly flexible suite of furniture on a regular basis to meet their needs. Collaborative areas are being more carefully designed to foster voluntary teamwork rather than forced comradery. For example, a social area such as a lounge might supplement or replace a standard benching system. Cubicle walls are going up again at the request of workers who prefer less distraction and a return to privacy. OBEX panel extenders play a role in creating a flexible office where employees have more control over their level of privacy. Our customers have confirmed that this is the wave of the future—and we’re here to help them create their ideal work environment. Does White Noise in the Office Cause Stress? Using white noise in the office is a commonly suggested remedy for covering up intrusive sounds at work. But that might be like prescribing a medicine with side effects as bad as the illness it’s designed to treat. Let’s explore a different perspective on whether white noise is really beneficial or if it just adds to the burden of excess noise in the workplace. Why Is White Noise Recommended? It’s very well established that noise in the workplace is a major source of stress. Unwanted noise is distracting and can be associated with low morale, poor health, and a number of other issues. Conversation is one of the most intrusive sounds, since the brain automatically tries to listen and understand what’s being said. But everything from whirring printers to ringing phones and clicking keyboards can be problematic. So, white noise may be used to help mask the hustle and bustle. Some of these sound tracks imitate noises found in nature, such as whispering breezes, waves, or rushing water. Others use specifically selected wavelengths of sound in spectrums known to be soothing. The idea is that the added layer of noise will help filter out or dampen the effect of less appealing sounds. Unfortunately, white noise in the office doesn’t always work as intended. Kery Floyd, writing for forcexinc.com, clearly states his dislike for this artificial sound. He finds that it actually makes concentration more difficult. Floyd points to a couple of studies that have shown mixed results for white noise. In one, individuals who typically had difficulty concentrating were helped by the noise. Those who were usually attentive suffered a decline in performance. White noise was something of an equalizer, but certainly not an overall performance booster for all participants. 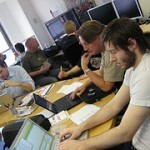 A summary of research published over at sonicstate.com offers a grim view of white noise in the office. It uses the research of Mark Andrews, (a physiology professor) to make the case that white noise causes stress and can lead to many harmful stress-related conditions. However, a closer reading reveals that Andrews is discussing low level background noise—which would include typical workplace sounds that we already know are distracting. It’s not specifically about white noise machines. At the same time, the comments on the article show a strong aversion to the use of “sound conditioning”. Complaints include headaches and distraction. Remember that perception is everything. If you do decide to use white noise, check to see if it is actually helping your employees. When you have workers complaining about white noise, it’s not the right solution. When it’s working right, no one should notice that it’s there. The lack of privacy in an open office actually restricts honest communication because of all the eavesdropping. Coworkers’ manners are a huge obstacle in open environments. They talk too loudly, don’t respect the privacy of others, and have conversations on speaker phone. Introverts pay a “social penalty” for not engaging on the same level as their coworkers. It’s unfair to expect all personality types to work in the same way. Theft is more likely to occur in an open office. It’s a hassle to have to lock your purse inside the desk if you get up to go to the copier. HR ends up with way more work to do in smoothing ruffled feathers when everyone is in everyone else’s business in an open office. Small shared areas work better than completely open offices. People working on the same project can be clustered together in small teams to promote collaboration. Closed floor plans make teamwork more productive because meetings have to be scheduled for a real purpose. People who work inside their heads need private space. They don’t want to be pulled into conversations or make everything a “team project” in an open office. Open spaces are OK for “creatives” working together on the same project, but people in operations roles need less distraction. The workstation isn’t the place for socialization. It should be a place to concentrate get work done. Meetings are the right environment for communication and collaboration. There is room for common ground in this ongoing debate. Most people do agree that the right solution is industry and job dependent. Confidentiality, privacy, and ethics are important considerations. There’s also widespread agreement that an ideal workspace makes room for both private areas and collaborative areas. OBEX panel extenders and desk panels offer a solution that’s easy to retrofit into any space to achieve just the right ratio. Do you have opinions about open offices to share? Let loose in the comments! Last month, we took an in-depth look at how to assist introverts in the workplace. But these individuals aren’t the only ones who can have difficulty concentrating in a busy office. Employee with ADHD (attention deficit hyperactivity disorder) also struggle to be productive in today’s open office plans. Noises that some people block out can be very disruptive to workers who already have a tough time staying on task. Is ADHD Covered under the ADA? Sometimes it is and sometimes it isn’t. That really depends on the type and degree of limitation a person experiences in going about their daily lives. However, accommodating these workers makes sense regardless of the degree of disability. Like any employees, those with ADHD will simply do higher quality work and be more productive in the office if their needs are being met. How Can Office Furniture and Design Help Workers with ADHD? In an open office layout that has desks but not cubicles, installing a single cubicle might pose a real challenge. However, our desk mounted privacy panels can be installed on any standard office desk in less than 5 minutes using our universal brackets. The solution is simple and inexpensive—a win-win for you and your employees. But not everyone is sold on the benefits of surrounding oneself with other people in a setting that’s meant to mimic a regular office. In fact, the best work often gets done in a solitary setting–without interruptions from office mates. As the problems that can arise with shared workspaces become more evident, some purveyors of coworking space are finding new ways to cope. For example, the Regus chain of business centers has installed “Thinkpods” that are like tiny round cubicles with space for a chair and a worksurface to hold a laptop. Kimberly Lilley, General Manager at a DFW area Regus, says people can choose to pop into a pod to focus on preparing a presentation. Others might choose to spend most of a workday in these cocoons of quiet. In contrast, the formal coworking spaces at a Regus feature little privacy, with desks positioned in an open layout with no desktop divider screens. However, in this instance shared space doesn’t mean shared schedules. According to Kimberly, the sales people who lease her site’s coworking offices don’t rub elbows that often. “It’s not really an issue. They aren’t all in the office at the same time.” Sometimes, the answer to the noise question really is about timing. The flexibility of the coworking culture allows workers to come and go as their need for privacy changes. Susan Cain, a self-professed introvert, is not exactly the person you’d expect to see giving a TED talk. 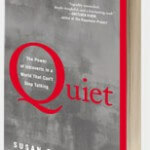 But her book “QUIET: The Power of Introverts in a World That Can’t Stop Talking” brought Cain into the public eye in unexpected ways. She gave a voice to everyone who has ever wished for more peace and quiet at work. While collaboration and socialization at the office can be wonderful, at least 30% of the population wishes for a workplace where these activities weren’t given so much importance. Many of the greatest ideas arise and most workplace productivity occurs when people are given space and time to really concentrate. For introverts, being required to perform “on demand” in a group setting can lead to anxiety over excessive scrutiny or criticism. But given a few hours alone, they can come up with amazing solutions or work at lightning speed to get critical tasks done on time. It’s not that they hate their coworkers. Introverts simply want to be able to choose their interactions with care to avoid depleting themselves. When they are part of a culture that overemphasizes what Susan calls “The New Groupthink”, their work suffers. What Type of Workspace Do Introverts Crave? A private office at work would probably be a dream come true—and working remotely from a quiet location like a home office is another favorite option. The worst possible workspace is an open office plan with no walls and no privacy. That’s not surprising since even extroverts can feel overwhelmed and stressed when there is constant noise. Introverts would usually prefer to have a cubicle rather than the type of open desk with low or no dividers that is prevalent in today’s office environments. Cain recognizes that the economics of the open office design make it too tempting for most companies to forego. But she believes there is a way to find some middle ground. Jim Hackett, recent Steelcase CEO and fellow introvert, agrees that it’s time to make a change. Cain is now collaborating with this leading office furniture company on solutions. “We’ve formed a partnership with Steelcase to create quiet oases of focus and respite for open plan offices, so that workers can move freely between social and private spaces.” Design ideas are due to be released sometime in 2014. DO: Acknowledge an employee’s special day. If you are their boss, make sure you mention it, and maybe a long lunch would be nice. If you are a coworker and are close, a little card or token is acceptable – if you just know them from across the office dropping in and saying “Happy Birthday” is sufficient. DON’T: Go over the top. It’s a workplace, not party central. The last thing everyone needs is a constant barrage of elaborate birthday parties. A singing telegram is the very last thing an employee wants – you have to work with them afterwards so don’t humiliate them! DO: Let the office be involved appropriately. Having a cake each month to celebrate everyone’;s birthday that month is ideal for large offices. If you work in a smaller office, get the whole office to go out to lunch or drinks after work. DON’T: Make it all about getting to booze it up at work. Keep the alcohol until after you’re done for the day. Arrange for a Happy Hour after work, so there’s nothing embarrassing going on on company property. Does your company allow birthday celebrations, or encourage them at work? Tell us your stories! Do you have the cubicle crazies? By that we mean the obsessive need to get OUT of the cubicle at regular intervals, for fear you’ll become a hermit and start keeping a pet rock as a friend? Here are a couple of easy ways to combat the cubicle crazies and get that much needed break. Make your cubicle a place you LIKE to be. That will make it more welcoming and you won’t feel so trapped. Try to keep it down to essentials and only have stuff in your cubicle that you need. Make friends. If you are included in the weekly gossipfest by the water cooler and get invited to every party with cake, you won’t feel so isolated! Eat lunch anywhere but in your cubicle. It’s vital to get out at least for half an hour or so and breathe non-cubicle air! Don’t be shy. work on projects with a partner so you have an excuse to get out of your cube and pop in to theirs a few times a day. Your cubicle shouldn’t doom you to a life of playing solitaire in between tasks. Make your cubicle a fun place, then schedule regular retreats to the outside world. You can beat the cubicle crazies! Why Avoid Open Office Plans? Is your office plan open, chaotic, unproductive and maddening? The hoped for camaraderie of your employees just never materialized and everyone seems disgruntled, harried and tired. Phones are ringing all over the place, you can see workers arched uncomfortably away from the person seated next to them, plugging the ear not glued to the phone with a finger and trying to hear their client over the in-office noise. It’s enough to make one long for the days of the closed office, but we all know those days are gone – square footage is at too much of a premium, and there’s no way the rank and file will be qualifying for four walls and a window anytime soon. Of course, the alternative – a regimented cubicle world – is almost as maddening – but what if a compromise could be reached? Cubicle height extenders could allow some leeway and prevent workers from being either too exposed or too isolated. Studies show that excess noise can actually undermine motivation; one study published in the Journal of Applied Psychology disclosed that 40 female clerical workers subjected to three hours of “low-intensity noise” were compared to a control group experienced three hours of quiet. Both groups were then given puzzles to solve – puzzles with no solution. The first group gave up quickly in frustration, while the second group stayed on task for much longer, trying new things and battling to complete the (unbeknownst to them) hopeless task. If noise is one of the most disruptive factors, another is lack of privacy, When your workspace is continually encroached upon by chatty neighbors, food, and people walking around, it’s hard to stay focused. Wearing earbuds can block out sounds as well as serve as a sign that you don’t want to be disturbed, but it won’t stop people from frantically waving at in a co-worker’s sight line to share the latest gossip or gripe about the vending machine offerings. Cubicles can provide a quieter, more private area, without devolving to feeling like employees are caged. 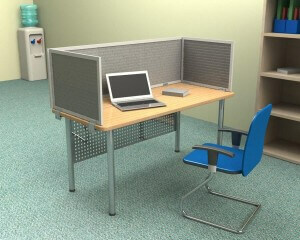 Panel extenders can adapt low height cubicles to the appropriate height for each employee – those who need to collaborate can be grouped in relatively low cubicle height wall areas, while those who need more privacy and quiet can be given slots with higher cubicle walls and the corresponding amount of solitude.